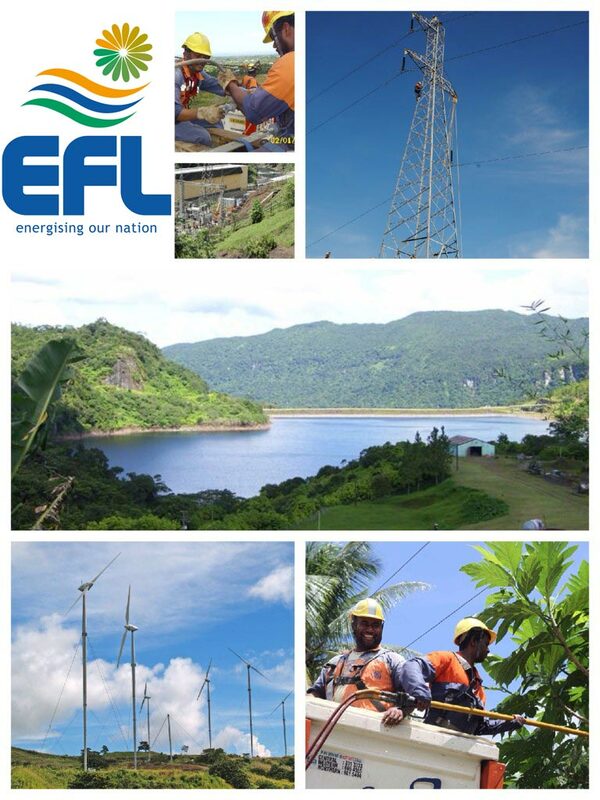 The EFL is a wholly Government of Fiji owned statutory body that was established under the Electricity Act of 1966. EFL is responsible for the Generation, Transmission and Retail of electricity on the larger islands, Viti Levu, Vanua Levu and Ovalau, which account for some 90% of the country’s population. Installed generation capacity is approximately 237MW, comprising 80MW Monasavu Hydro Scheme and 40MW Nadarivatu Hydro Scheme in Viti Levu and about 112MW of diesel capacity in 14 stations on the three main islands. Of the diesel capacity 92MW is on Viti Levu which has been supplementing the Monasavu hydro scheme for the Viti Levu Interconnected System (VLIS) which has been reaching maximum demand of 152MW. Transmission is provided by 145km of 132kV lines (connecting Wailoa & Nadarivatu Hydro Power Stations to the East and West coasts) and about 350km of 33kV lines. Power distribution is by means of more than 8,000km of 11kV and 415/240V lines.